Medium sized dogs need foods specifically formulated for them in order to prevent them from developing nutrition-influenced diseases. While they may fall in the middle of the pack, their nutritional needs are different than those of small and large breeds. The best dog food for medium sized dogs will give your adult canine companion the balanced nutrition that his body requires and help to prevent potential illnesses. Commercial adult dry dog food brands are specifically designed to hit every nutritional marker in canines, and they're much more convenient than the alternative – homemade dog food. You need to do a lot of research and work with a trained canine nutritionist to create homemade recipes that will meet your dog's specific needs. If you don't do it properly, your homemade dog food could either leave your pup deficient of nutrients or with a toxic level of certain vitamins and minerals in his system. If you feed your pet an improper diet for too long, it could lead to serious health consequences including death. * Click on the best dog food for medium sized dogs for more information, prices and details. Scroll below to read reviews. Dogs, in general, need adequate levels of protein to support their growing needs and body functions, and meat is the best source for this. However, animal-derived protein also contains high levels of calcium and phosphorous, which must be kept in controlled levels and ratio. There is no cut-and-dried formula for choosing the right food for your medium breed dogs. Most highly-active or working dogs are medium breed dogs, and these dogs need high-calorie count for their energy needs. They also need high protein food to build lean muscles and strong bones. However, there are also medium breed dogs that live relaxed lifestyles like their sedentary owners, and these dogs tend to go obese with the extra calories that go to their diet. This means that it is important to take the dog’s activity level when making decisions regarding feeding. Your dog also needs certain vitamins and minerals added to their diet. Depending on your pooch's energy level, overall heath condition and age, you also need to ensure that he's getting the right amount of calories. There's a lot more to properly feeding a dog than you may have originally thought, and the best dog food for medium sized dogs is designed specifically to meet the unique needs of these canines. Feeding a homemade diet is possible, but pet owners need to be extremely careful about their dog's nutrition. It's not impossible, but makes for an extremely complicated process of daily cooking and measuring of food to hit your dog's exact nutritional needs. Picking a pre-made dog food for medium sized dogs with a formula designed for their size is often what vets recommend. A consultation with your veterinarian is always a great starting point, but remember that they may not even be able to give you the most accurate information. Either way, they will be able to point you in the direction of appropriate sources that can help you. Below, we'll share ten options for the best dog food for medium sized dogs. What Is the Best Dog Food for Medium Sized Dogs? Victor's Yukon River Salmon & Sweet Potato Canine Formula contains 398 kcal of metabolizable energy per cup, with 33% protein and 15% fat. This is perfect for dogs with high calorie requirements, such as medium breed dogs with active lifestyles. This is a hypoallergenic formulation as well. Victor Dog Food Grain-Free Yukon River Canine Salmon and Sweet Potato is prepared from salmon and contains no grains, making it the brand most preferred by picky dog owners. Medium breed dogs would benefit from this formula for its caloric profile, and it’s the best dog food for medium sized dogs with food allergies. This has easily become the go-to food for dogs with a lot of sensitivities because it does not contain pork, poultry, beef, or meat protein sources other than fish. It’s absolutely free from grains or genetically-modified ingredients, too, so it’s no wonder that dog owners prefer Victor Yukon River dog food over other brands in the same category. Fromm Family Foods has created Gold Nutritionals Adult dog food that is made from duck, chicken, chicken meal and fat, menhaden fish meal, brown rice, barley, oatmeal, lamb, whole eggs, Wisconsin cheese, potatoes, flaxseed, carrots, alfalfa, celery, salmon oil, herbs, and probiotics. This best dog food for medium sized dogs is made by a family company that believes in the importance of producing only wholesome food for pets. Ingredients: Duck, Chicken Meal, Chicken, Brown Rice, Pearled Barley, Oatmeal, Menhaden Fish Meal, Chicken Fat, Lamb, Potatoes, Dried Tomato Pomace, Dried Whole Egg, Salmon Oil, Cheese, Flaxseed, Brewers Dried Yeast, Alfalfa Meal, Carrots, Lettuce, Celery, Chicken Cartilage, Monocalcium Phosphate, Salt, Potassium Chloride, DL-Methionine, L-Tryptophan, Taurine, Chicory Root Extract, Calcium Sulfate, Yucca Schidigera Extract, Sodium Selenite, Sorbic Acid (Preservative), Vitamins,Minerals, Probiotics. This is no doubt an energy-dense formula at 408 kcal per cup containing 24% protein and 16% fat. This is recommended for adult dogs with normal activity level. Feeding dogs Fromm Family Foods Gold Nutritionals Dog Food and factoring in their activity level helps in maintaining the dog’s ideal weight and in developing muscle mass. Dog owners compare this to the other brands they’ve used, and they say that the amount of Fromm Gold dog food they feed their dogs is much less than the amount of their previous brand. Fromm Gold is so calorie-packed that your dog doesn’t need so much volume for the same amount of calories. It really makes a lot of sense, both nutrition-wise and economy-wise. According to dog owners, they’re happy that they have shifted their adult dog to this formula. Their dog’s energy level has clearly improved, digestive issues have vanished, and their dog’s skin and coat have become enviably healthy after only a few weeks on the Fromm Gold. The makers of Merrick's grain-free dog food use real deboned meat as their product’s first ingredient. Seventy percent of the ingredients are sources of protein and fat, while 30% are sources of high-quality carbs and other nutrients. This particular recipe has real deboned buffalo as the first ingredient, contains no grains, and is power-packed with wholesome ingredients like chicken, turkey, salmon, sweet potatoes, potatoes, peas, alfalfa, blueberries, apples, flaxseed oil, and probiotics. There are other recipes in this product line with variations in the first ingredient, such as chicken, duck, lamb, beef, turkey, venison, salmon and rabbit. This best dog food for medium sized dogs provides 364 kcal per cup and contains 38% protein and 16% fat. Medium breed dogs would benefit from this best dog food for medium sized dogs for its high-protein and high-calorie content, along with other nutrients required for healthy joints and overall health. Since Merrick Grain Free Dry Dog Fodd is grain-free, this will also be good for dogs that react adversely to grains. There’s been a lot of concern about importing ingredients for dog food, and Merrick remains a trusted brand for continuously sourcing its buffalo ingredient from the USA. This aspect is obviously very important for dog owners and most of them patronize Merrick for this reason. It goes without saying, of course, that they’re very satisfied with how healthy their dogs are, how silky their coat has become, and how great their dog’s energy level always has been with this dog food. This dog food is made from ingredients that are 70% animal-derived – chicken, turkey, eggs, trout, and walleye – and 30% of which are plant-derived – fruits, vegetables, herbs and probiotics. Acana Wild Prairie Regional Formula is made of 100% real food sourced from local farms and the cold lakes of Canada. Acana is often recommended for medium breed dogs because its first two ingredients come from real whole meat. Ingredients: Fresh chicken meat (8%), fresh turkey meat (8%), fresh chicken giblets (liver, heart, kidney) (8%), chicken meal (8%), turkey meal (8%), whole herring meal (8%), whole green peas, whole red lentils, whole chickpeas, fresh whole eggs (4%), fresh wild-caught walleye (4%), fresh wild-caught trout (4%), chicken fat (4%), fresh turkey giblets (liver, heart, kidney) (3%), whole green lentils, whole pinto beans, whole yellow peas, sun-cured alfalfa, pollock oil (2%), lentil fiber, dried chicken cartilage (1%), dried brown kelp, fresh pumpkin, fresh butternut squash, fresh parsnips, fresh green kale, fresh spinach, fresh mustard greens, fresh turnip greens, fresh carrots, fresh red delicious apples, fresh bartlett pears, freeze-dried liver (chicken and turkey) (0.1%), salt, fresh cranberries, fresh blueberries, chicory root, turmeric root, milk thistle, burdock root, lavender, marshmallow root, rosehips, enterococcus faecium. Acana Wild Prairie Dog Food – Regional Formula has 35% protein and 15% fat. It has adequate levels of omega 3 and 6 fatty acids for healthy skin and coat, glucosamine and chondroitin for healthy joints and hips, probiotics for good digestion and strong immune system, and antioxidants to fight off free radical damage. This best dog food for medium sized dogs provides 462 kcal per cup, and there will be no problem fulfilling a medium breed dog’s energy requirements with this level of metabolizable energy. Dog owners must always be watchful of any fluctuation in their pet’s weight and energy levels. Sudden spikes might mean that their dog’s food is not adequate for their energy needs or for keeping them at their ideal weight. These were some of the reasons why many pet owners shifted their pet to this best dog food for medium sized dogs. The high calorie content of Acana comes mainly from protein not carbohydrates, which is low. This low carb level helps keep dogs from going obese, while the high calorie supply keeps up with the dog’s actual energy needs. 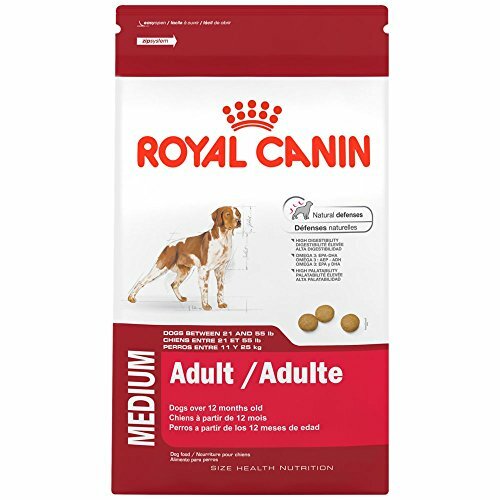 Royal Canin Size Health Nutrition Adult dry food is specially formulated for medium breed dogs 1-7 years old (adult age bracket for medium breeds) and weighing 21 to 55 pounds. At this age bracket, these dogs must have achieved their maximum skeletal size, and their diet must be adequate to help them fill out and gain their ideal weight. Royal Canin’s ingredients include brewer’s rice, chicken by-product meal, beet, fish oil, wheat, corn, and herb extracts. A cupful of this dog food provides 334 kcal of energy, and has 23% protein and 12% fat. This best dog food for medium sized dogs is enriched with omega 3 and 6 fatty acids that make the dog’s skin healthy and its coat shiny. Royal Canin Size Health Nutrition Medium Adult Dry contains antioxidants that help build the dog’s natural defenses and help fight off the ill effects of free radicals. Its calorie profile is well balanced for sustaining the dog’s physical activities, building body mass, and maintaining ideal weight. Dog owners saw dramatic changes in their dog’s health after feeding them with this best dog food for medium sized dogs, and they have not fed their dogs any other dog food since. This dog product had been a real life changer for them. They’ve tried out many brands but their dog’s tummy issues and skin irritations persisted. Their luck has turned after switching to Royal Canin, and their dogs had shinier coat, smaller and firmer stool, and had much improved stamina. Now they’re in their best shape and they continue to be interested in this dog food. Medium breed dogs that stay indoors most of the time as pet companions and are only moderately active must have a diet that has lower fat, a lower overall calorie count, and all the nutrients needed for the dog's physical and mental functions. AvoDerm Natural Dog Food Brown Rice & Chicken Meal formula for weight control has combined all the best ingredients to provide your pet with vitamins and minerals, antioxidants, essential fatty acids and less fat and calories than most of the other brands out there. AvoDerm Natural Dog Food is made from brown rice, chicken meal, omega-rich avocadoes, and other carefully chosen ingredients to maintain good health while keeping the dog’s weight at normal limits. This best dog food for medium sized dogs has a protein content of 20%, fat content is a low 8%, and a total calorie count of 329 kcal per cup. It contains no corn, wheat, or soy. According to a dog owner, they fed this food to their dog that had problematic skin due to pancreatitis. Their dog’s previously lifeless fur is now rich and shiny, and it’s thriving so well on AvoDerm’s low-fat diet which is good for pancreatitis. The high-quality fat and correct omega fatty acid ratios contained in AvoDerm help to abate conditions caused by a high fat diet including obesity, high blood pressure and pancreatitis. The nutritionists behind Natural Balance Original Ultra Whole Body Health created a dog food that optimally balances nutrients to attain overall health in terms of digestion, brain and body development, and strengthening the immune system. This best dog food for medium sized dogs is made from chicken, brown rice, chicken meal, lamb meal, duck meal, duck, salmon meal and oil, barley, potatoes, carrots, flaxseed, spinach, cranberries, other vegetables and fruits, and vitamin and mineral supplements. Each cupful provides 375 kcal of energy containing 23% protein and 13% fat. This healthy calorie profile supports a medium breed dog as it lives an active lifestyle and maintains the proper weight. Natural Balance Original Ultra Whole Body Health Dry Dog Food has multiple types of fiber for healthy digestion, maintains a healthy ratio of omega 3 and 6 fatty acids for your dog’s healthy skin and beautiful coat, and is packed with antioxidants to make your dog glow with health and develop a robust immune system. Not a few dog owners switched their dogs to this formula from high-protein high-fat diet because their medium breed dogs couldn’t handle the excess in calories. They were having runny stools and gaining weight. Natural Balance did turn out to be gentler on their dogs’ tummies. It helped in maintaining the proper weight, too. Dogs love every bit of their Natural Balance meal, and that makes feeding time a lot easier and more enjoyable. This best dog food for medium sized dogs is made from three meat protein sources needed for building muscle mass, wholesome whole grains needed for an active life, and twelve super foods needed to strengthen the immune system and support biological function systems. Nutro Ultra’s ingredients list is a wish list of wholesome food sources including chicken, lamb, and salmon, and mouthwatering fruits and vegetables like blueberries, apples, and chia seeds. The metabolizable energy in every cup of this best dog food for medium sized dogs is 341 kcal, with 25% protein and 14% fat. This energy profile is ideal for active medium breed dogs. The calcium to phosphorous ratio is 1.2:1, which is within healthy limits. Nutro Ultra Medium Breed Adult Dry Dog Food has long been a staple dog food in many homes raising medium breed dogs, and dog owners attribute their dog’s good health to it. The dogs have a smooth and shiny coat and excellent overall health to show for, so Nutro Ultra must really be that good. Some pet owners experimented with other brands for variety, but they always came back to Nutro. Their dogs seemed to have a dull appearance and somehow looked like something was off with them in their other brand of dog food. Switching back to Nutro, the dogs were their old bright selves again within a week. You can’t blame their owners for thinking it’s the food; they could be right about that. This Diamond Pet Food's recipe is an excellent source of nutrients for medium breed dogs. A cupful of this formula provides 337 kcal of metabolizable energy, containing 25% protein and 15% fat. Its guaranteed analysis also shows healthy levels of zinc, selenium, omega 3 and 6 fatty acids, vitamin E and probiotics. This dog food has lamb as its first ingredient, which is one of the best sources of high-quality protein. Its other ingredients include white rice, barley, peas, rice bran, fish meal, beet, flaxseed, kelp, quinoa, chia seeds, kale, carrots, blueberries, and other wholesome ingredients. Diamond Naturals Dry Food for Adult Dogs formula has two other variations – beef and chicken – which make for good additions to your dog pantry in case your dog starts looking for other tastes. That way you get to vary the flavor but maintain the same goodness and nutritional value that Diamond Naturals offers. Dog owners were amazed at how much Diamond Naturals transformed their dog in just a matter of weeks. A pet owner fostered a very sick and emaciated dog and fed it with this best dog food for medium sized dogs. The dog took to it like a turtle would to water, and in just over a month the dog turned into a robust and enthusiastic dog. He’s obviously very healthy and the luster on his coat says it all. Dogs wouldn’t know about the nutrient profile of NutriSource Grain-Free Chicken formula, but they would certainly know how full-flavored it is. Chicken is this dog food’s first ingredient, and that shows through its high palatability. And although dogs have no idea about it, this NutriSource formula is calorie-dense and nutrient-packed. A cupful provides 476 kcal, 28% of which is protein and 18% is fat. A medium breed dog must be highly athletic to burn up all those calories. High-quality protein is important for muscle formation and repair. Aside from protein, this formula also contains glucosamine and chondroitin for healthy joints and hips, omega 3 and 6 for great coat and skin, probiotics for proper digestion, vitamins and minerals, and other nutrients for a dog’s optimum health. The Chicken & Pea and Lamb recipes provide variation. NutriSource Grain Free Dog Food is a great option for dogs allergic to grains. It’s hard enough finding the right combination of nutrients to feed your dog; it’s harder still to find one that gets the dog’s approval. Then here comes this best dog food for medium sized dogs, and dogs just can’t stop loving it. It keeps them feeling longer, too, so there’s not much need for treats and mid-meal snacks. That’s especially wonderful for cost-cutting and keeping off extra calories.